Charley’s Fund, Duchenne UK, and Joining Jack recently announced a collaborative grant to Dr. Dada Pisconti of the University of Liverpool in England. With this grant and additional funding from the Medical Research Council (MRC), Dr. Pisconti is exploring whether a type of therapeutic known as “neutrophil elastase inhibitors” may help slow or stop the progression of Duchenne muscular dystrophy (DMD). We sat down with her for a quick Q+A on what has her excited about this line of research and what she hopes to achieve with this grant. I think the most exciting thing about the potential use of neutrophil elastase inhibitors for the treatment of DMD is that these drugs have been already in the clinic for other diseases (usually cystic fibrosis and COPD), and this means a potentially faster timeline to delivering them to boys with Duchenne. We know they are safe and have very few side effects. Therefore, if they show promising results in the preclinical studies that we are about to start in dystrophic mice, the repurposing of these drugs for DMD could be relatively quick compared to drugs that start from scratch and have never been in humans before. Moreover, these drugs are expected to be effective in all patients with DMD, irrespective of the specific underlying mutation. 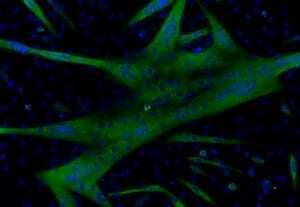 Stem cells isolated from mouse muscle are grown into myotubes in a culture dish. Myotubes have muscle fiber-like properties useful for testing drugs like NE inhibitors. Neutrophil elastase (NE) is a “protease” – a protein that cleaves other proteins. NE in particular is a very potent protease released by neutrophils, a subset of white blood cells, in damaged tissues or at the site of an infection. It targets several proteins that play important roles in the muscle regeneration process, such as cytokines, which are mediators of inflammation, and extracellular matrix proteins, which are the “glue” that keeps cells together. In a normal response to injury, NE is present in the muscle tissue only transiently and helps by triggering a healthy regenerative response. We found, however, that muscles of dystrophic mice show constantly high levels of NE. The elevated NE levels in dystrophic muscle damage the muscle cells, promote chronic inflammation and fibrosis, and prevent muscle stem cells from regenerating the damaged muscle. By inhibiting NE, we hope to mitigate those negative effects. In real life, scientists almost never have a Eureka moment. Discoveries like this come from relentless, meticulous work, usually carried out by a team of people who learn something new every day. And after the discovery, there’s much more work like that still yet to be done. It’s pretty much like building a house with many small bricks, step by step, day by day. With this project, we’re doing a few things. To begin with, we have three different NE inhibitors that could be advanced toward the clinic. We have to start by running tests that will help us identify which one should have the best shot of working. Once we know this, we begin a series of tests in mice to see what impact it has on several biological and functional measures. We will give that NE inhibitor to mice that have muscular dystrophy for 12 weeks. During these 12 weeks, we will check whether grip strength of the mice treated with the NE inhibitor has improved compared to the grip strength of mice treated with a placebo. We will also record how much mice exercise when we put a guinea pig wheel in their cage. At the end of the 12 weeks, we will measure tissue integrity via MRI, and we’ll measure the force produced by single muscles, CK levels and many other parameters. In parallel, we will also treat mice with prednisolone so that we can compare whether the NE inhibitor is better than the current standard of care at ameliorating signs and symptoms of muscular dystrophy. This study aims to provide what we call a “proof-of-concept” – in other words, proof that NE inhibitors have some efficacy in a living organism with muscular dystrophy. If the results of this initial proof-of-concept study are positive, it means we can build on that knowledge to continue laying more bricks, so to speak. What exactly comes next will depend on what we learn from this research program. If the results are positive, we may want to validate the test in another animal model. We may also find there’s reason to test more doses to be sure that we give this treatment approach the best possible chance of success when it’s time to conduct a human clinical trial. Looking out even farther, we can start thinking about things like whether the NE inhibitor might have heightened efficacy in combination with other therapies. But first and foremost, we want to see if we get the proof-of-concept we hope for. If we do, next steps will be designed to get a NE into a human clinical trial swiftly, safely, and smartly.